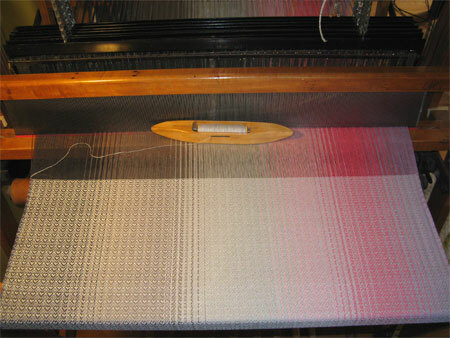 Since I came back from the show this past weekend I’ve been weaving like mad. I feel behind schedule with my handwoven baby wraps. I wanted to make quick progress on MY & JM’s wraps. In between grocery shopping, laundry, giving the dog a haircut and bath, & other miscellaneous tasks, I’ve managed to get about 3/4 of MY’s woven. I’m hoping to finish it today and start on JM’s. I have the yarn in house for 2 more wraps. I also need to weave another 2 dozen bookmarks (sold that many last weekend), a bunch of towels (they’re gaining in popularity), more silk shawls (I sold the 3 I had), a special order silk scarf (I’ll warp for 3), a custom rayon chenille scarf (I’ll warp for at least 2), and sew more of my bags for sales, all the while staying on top of my custom baby wraps. Are you tired yet? Fortunately, the bookmarks, towels, and shawls don’t need to be done till mid-November. I won’t want to wait till the last minute, so I’ll stick them in between my baby wraps when I can.